Google is enhancing its TrueView ad solution to provide brands with greater interactivity and more accurate accounting of audience engagement. TrueView ads were introduced five years ago to give users the choice to watch or skip ads. According to Google, the ads were created with the belief that viewers would choose to watch ads on YouTube if the ads were interesting, relevant and engaging. Since then, TrueView ads have expanded to mobile, became more measurable with Brand Lift and enable more interactivity with features like app downloads. Now, Google is further enhancing TrueView ads with an interactive cards feature and more accurate accounting of audience engagement. For starters, the new cards feature for TrueView in-stream ads makes video ads more engaging and interactive for viewers across screens. The cards are an evolution of YouTube’s annotations feature and were initially launched last month to provide a better way to inform viewers about other videos, playlists and more. With cards coming to TrueView in-stream ads, brands can share more information, such as related videos and playlists. 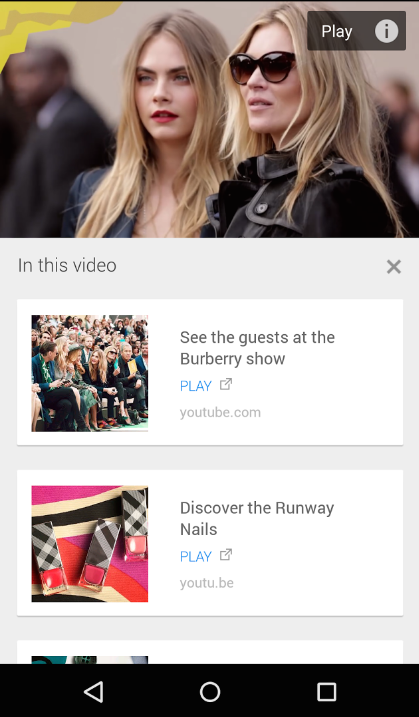 Plus, brands will soon be able to link their website directly from their TrueView video ad. Google also announced that in addition to counting a view when someone watches an ad, it will also count a view when viewers click on a card or other element of a brand’s in-stream creative. Google notes that consumer clicks are a strong indication that they are interested and engaged with an ad, so it will start billing for click interactions in a similar way as the company currently bills for TrueView app promotion campaigns. That said, Google will only charge when a view is counted and will only bill for either the full view or he click – not both. This change will roll out to all TrueView in-stream ads in May. It is also important to note that in order to ensure that brands are only paying for deliberate clicks on their ads, Google is changing where someone can click on in-stream ads. Previously viewers could click anywhere on the player to register a click, but not only clicks to cards to CTAs, the video header, companion banner or a link at the bottom of the player will count as a click.